Manning is clearly a doomer, and a traitor to the species, who thinks the earth would be a better place without people on it, because humans are a pestilence... a CANCER. Still... the idea of "eating oil" is interesting. It makes you wonder: if we can eat oil, can we eat uranium? As we have seen earlier, nitrogen fertilizer is not made from oil. It is made from natural gas (or syngas produced from coal). The interesting thing, though, is that the only part of the natural gas used in the production of ammonia (the basis of nitrogen fertilizer) is the hydrogen. Since hydrogen can be produced through the electrolysis of water, it is possible to produce fertilizer from WATER, as noted in the above passage. The energy necessary for producing the ammonia can also be derived from fission, so clearly (if necessary) we can turn uranium into nitrogen fertilizer. First of all, I was highly amused by the way you confuse what is technically possible with what is affordable. 6/ decommissioning the plant after it’s usable lifetime. When you pass all these costs on to farmers, I’m sure they’d go bankrupt or else the food would become unaffordable and then we are all in trouble. The same with the food tower. If you grow your food in a vertical farm, how much does the food cost? Now I’m no great mathematician, but really… you can either grow wheat out in the cheaper open plains country by the hundreds of hectares, paying mainly for harvesters, fuel, and fertilizers… or you can build a multi-million dollar food tower that might feed AT THE MOST 5 to 10 families. Have you ever worked out how much land it requires just to feed ONE person? This might be part of a highly subsidized government Moon or Mars program, but back here in the real world why don't you ask your local farmer what would be financially viable… cheap land out in big sky country, or “land” you have to pay for by the meter! And you have to provide all the “rain” and “sunlight” yourself, with your own plumbing and electricity? Hmmmm. $2000 for a loaf of bread anyone? Secondly, I was staggered at your ignorance of fertilizers. Sure technically you could generate nitrogen from any process that has enough energy…. I’m not disagreeing with that. But you’ve only accounted for one of the three main fertilizers! It takes NPK to grow our foods. You’ve only dealt with the N (and very inadequately because of the expense issue you ignored.) But the PK? Do you at all admit the oil involved in mining and transporting the PK? Do you even know what they are? Back to the drawing board JD. It was funny, though I wish those little old ladies (from the audio file) were here to teach you a lesson, you naughty boy! Please account for the PK next time you write about fertilizers, and the oil involved in obtaining and transporting them. After peak oil we might be facing peak phosphorous. As Heinberg writes, there are just too many people using too many resources too quickly. Oil IS food… when did you see a harvester that ran on batteries? I'll quote from the page directly. "The cost of farming will be extremely low. 1 acre of land can produce millions of tons of food each year. Each year, American farmers spend 7 billion dollars on insect killing chemicals. But once we start farming in the sky scrapers, farming will become indoor. That means they no longer need to spray insect killers. Vegetables will also become cleaner and safer for us to eat." Yeah right!. As you can see, what would happen during peak uranium, the earths population at 50 billion, all food grown in the giant building and all of them the lights go out because uranium has run out. JD give me peakoil anyday compared to that! The day is coming where oil will be prioritised to certain groups, farmers being one of them. 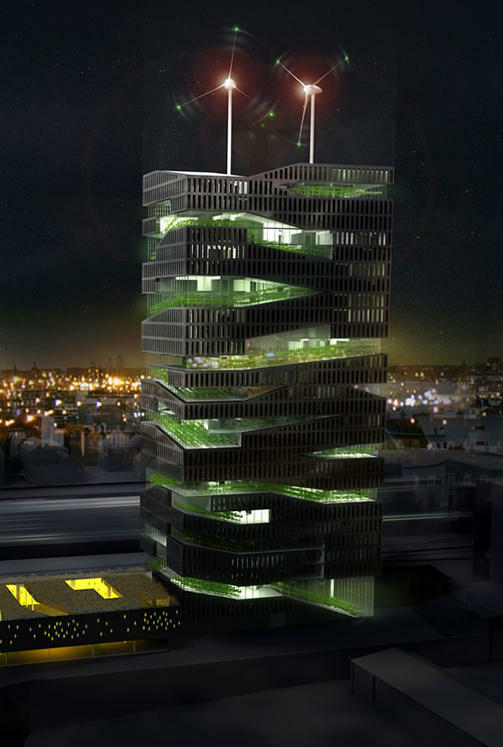 Peak oilers are obsessed by Free markets..
Wow, I really like this vertical farming concept. Sure it’s a new technology requiring development to become cost effective, but if the necessary technological issues are solved it’s got some real potential. But stuff uranium. Solar is the future. Space based solar power to be specific. Electricity collected in massive highly efficient PV systems in orbit, sent to Earth down the same carbon nanotube cables that allowed the systems to be cheaply built, and distributed at extremely low costs to major cities. Then systems like vertical farming will actually be more cost effective then traditional methods. I suspect that carbon nanotube technology will be the key technology in saving our collective asses. JD and the medical ecology group behind the vertical farming website have the same rights (end even credentials) to speak about the future of agriculture my fellow anonymous poster. "Richard Heinberg is a journalist, educator, editor, lecturer, and musician." He might be a core faculty of the New College of California but I see no reference to his studies. I do not doubt that he is a smart person but let's give academic groups with actual credentials (JD was reposting) a little bit more credit. I farmed most of my life in Canada. Where I live, you can buy an acre of farmland for $600. An acre is 43,560 square feet. That's 1.3 cents per square foot. Manhattan high-rise offices sell for $250 to $750 per square foot. To put a fine point on it, growing space in your high-rise towers would cost about 50,000 times more than farmland. While that would not translate, directly, into the cost of food increasing 50,000-fold, it might mean increases in the 1,000- to 10,000-fold range. I’ll leave calculations of affordability to others.